✔️COMPLETE. All 8 B Vitamins are included within our Cultavit Whole Food Plant Based B Complex including Folic acid, Niacin and Riboflavin. ✔️OPTIMIZED. Austrian made Cultavit optimizes and standardizes biological growth and seeding processes of buckwheat so that essential nutrients, such as vitamins, minerals and trace elements can be concentrated in its natural matrix. Buckwheat has been used as a crop for many centuries – in Europe and around the world – and despite its name buck”wheat”, it is 100% gluten free. ✔️NATURAL, HIGH QUALITY. 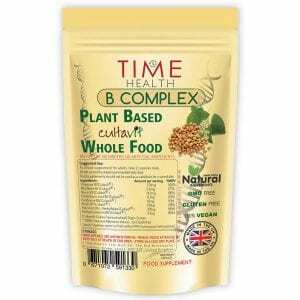 Time Health’s wholefood plant-based B Complex. Contains raw, completely natural buckwheat. Manufactured in the UK to GMP standard. ✔️100% VEGAN WITH NO FILLERS, BINDERS OR ADDITIVES. 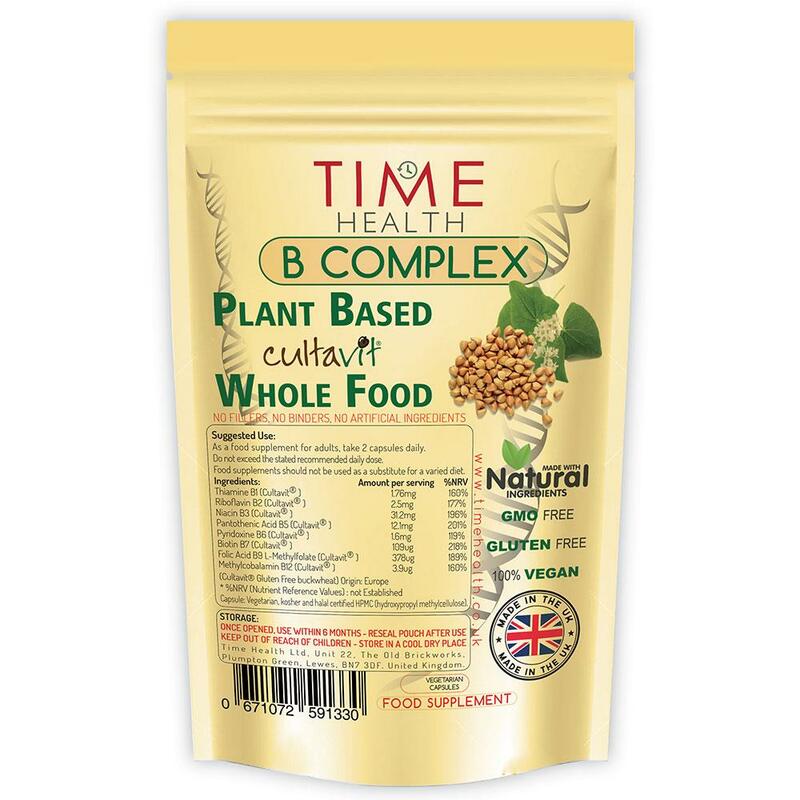 Our B Complex is 100% vegan friendly. At Time Health we believe in clean nutrition which is why you won’t find any nasty stuff in our products including any fillers, binders or additives, unlike some of our competitors. This is a 100% vegan product. Our capsule shell is made from HPMC (hydroxypropyl methylcellulose). This is made up of the trunks of pine and spruce trees that come from the Southwestern United States. HPMC-capsules are colourless, elastic and dissolve as quickly as gelatine capsules. Manufactured in the UK to GMP quality assurance with only the finest quality raw materials. 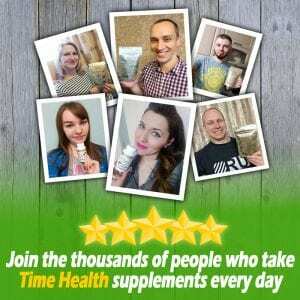 As a food supplement for adults, take 2 capsules daily, or as directed by a healthcare practitioner. Do not exceed the stated recommended daily dose. B1 (thiamine):Thiamine plays an essential role in metabolism by helping convert nutrients into energy. B2 (riboflavin):Riboflavin helps convert food into energy and also acts as an antioxidant. B3 (niacin):Niacin plays a role in cellular signaling, metabolism and DNA production and repair. B5 (pantothenic acid):Like other B vitamins, pantothenic acid helps your body obtain energy from food and is also involved in hormone and cholesterol production. B6 (pyridoxine):Pyridoxine is involved in amino acid metabolism, red blood cell production and the creation of neurotransmitters. B7 (biotin):Biotin is essential for carbohydrate and fat metabolism and regulates gene expression. B9 (folate):Folate is needed for cell growth, amino acid metabolism, the formation of red and white blood cells and proper cell division. B12 (cobalamin):Perhaps the most well-known of all the B vitamins, B12 is vital for neurological function, DNA production and red blood cell development. These statements have not been evaluated by any official health authority. These products are not intended to diagnose, treat, cure, or prevent any disease. Customer reviews on our site are provided for informational purposes only and are not intended to diagnose, treat, cure or prevent any illness or disease. The Old Brickworks, Plumpton Green, Lewes, BN7 3DF, UK. These terms and conditions govern the sale of goods, by us, Time Health Ltd, to you the buyer on our website www.timehealth.co.uk. These terms and conditions constitute the entire agreement between Time Health Ltd, and you the customer. Please read these conditions carefully before making purchases from Time Health Ltd products. By ordering our products, you represent your agreement to be bound by these terms and conditions. Items sold by Time Health Ltd are dispatched and completed in the UK, the UK law shall govern every aspect of contractual agreement concerning purchases made through us. 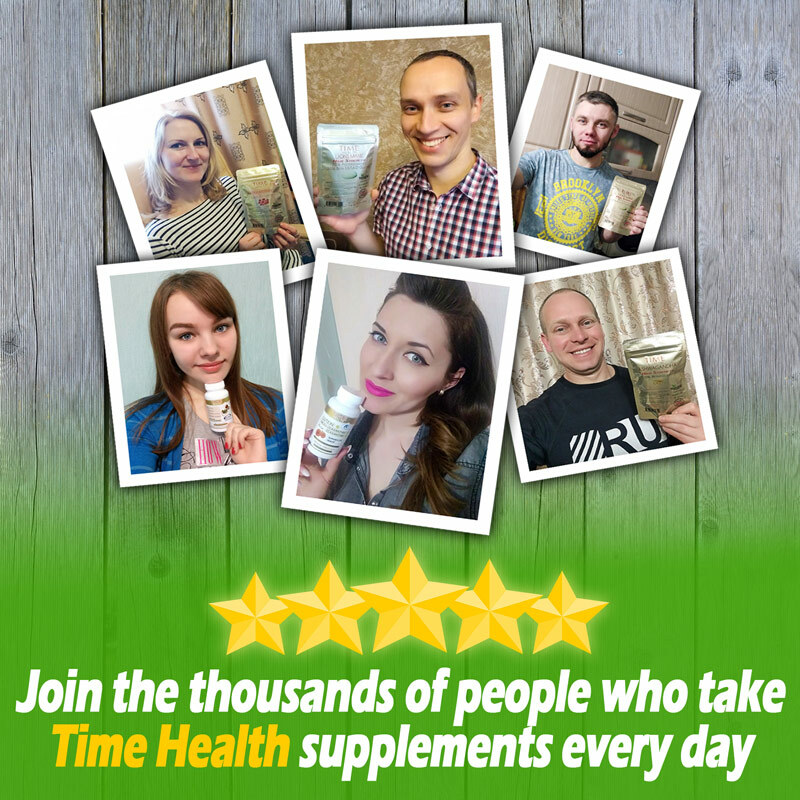 When you place an order on our website www.timehealth.co.uk to purchase products from us that constitutes as an "Offer to Buy" from you. We accept this order when we send you an "Order Confirmation" email confirming that we have dispatched the products you have ordered from us. That acceptance will be deemed to be complete and communicated to you at the time we send the Confirmation or shipment email, whether you have receive that email or not. We will send you an invoice/delivery note setting out the cost of your purchase, together with the total cost of postage and packaging if applicable. We reserve the right to request that we receive payment from you before we supply any products to you. Once you have confirmed your order and delivery details you are taken to a payment page that is securely hosted by either Sagepay or Paypal. We use Sage Pay or Paypal to collect/process transaction information. If you would like further information about the way that Sage Pay ensure your security, please see their Security Policy http://www.sagepay.co.uk/policies/security-policy. The SagePay payment system will require CVV2/CVC2 verification during the payment process. If you would like further information about the way that Paypal ensure your security, please see their Security Policy https://www.paypal.com/uk/webapps/mpp/paypal-safety-and-security. All ownership, title and risk of loss and/or damage in the product you have purchased shall pass to you at the point and time at which such product leaves us. All sales are ex works. This means that the sale is completed in the UK and all goods remain in the UK before any sales transactions are conducted. When you communicate with Time Health Ltd or send e-mails to us, you are communicating with us electronically. We communicate with you by e-mail or by posting information on our website www.timehealth.co.uk. For contractual purposes, you consent to receive communications from us electronically and you agree that all agreements, notices, disclosures and other communications that we provide to you electronically satisfy any legal requirement that such communications be in writing. This condition does not affect your legal rights. We, Time Health Ltd, reserve the right to make changes to our policies, and these terms and conditions at any time. You will be subject to the policies and terms and conditions in force at the time that you order goods from us, unless any change to those policies or these conditions is required to be made by law or government authority (in which case it will apply to orders previously placed by you). If any of these conditions is deemed invalid, void, or for any reason unenforceable, that condition will be deemed severable and will not affect the validity and enforceability of any remaining condition. Your relationship with Time Health Ltd is governed by and construed in accordance with the laws of the United Kingdom. You agree, as we do, to submit to the non-exclusive jurisdiction of the Courts of the United Kingdom.